doubt with the design. But in terms of function the disc brakes are an advantage. What has proved itself in the MTB market has a future also in the road race cycling, precisely because one is on the move with much higher speeds. 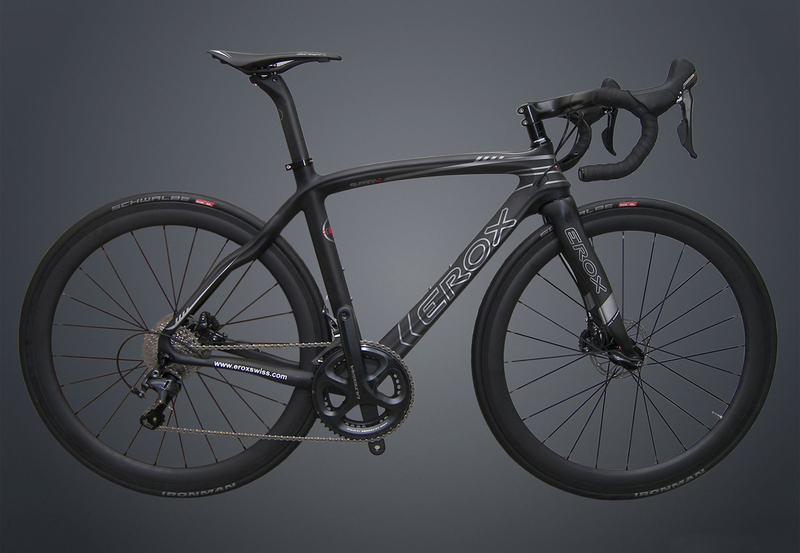 EROX has developed a frame specifically for disc brakes, with higher strength in the fork and brake structure. The EROX Quarra D impresses with elegance! There are no cables hanging around. Everything is put into the frame, even the brake hydraulic cable, this construction offer best protection of the sensitive cables. But above all of that it looks clean. The windings and bends in the frame bring a higher stability despite a low frame weight and are therefore ideal for disc brakes. Brakes in the center instead of on the rim need appropriate frames. The windings and bends in the QuarraD frame bring higher stability despite a low frame weight. The fork (see below) and the frames rear stay construction are ideal for a disc brake mount..
Exceptionally comfortable seating position and the best braking performance under all conditions, thanks to the hydraulic flat mount disc brakes. Brakes in the center instead of on the rim need appropriate frames. The windings and bends in the QuarraD frame bring higher stability despite a low frame weight. The fork (see below) and the frames rear stay construction are ideal for a disc brake mount.